Four years ago, I met the girl of my dreams. Two-and-a-half years ago, we started dating. Her name is Liz. She is beautiful, smart, funny, talented, caring. I love her dearly. We love one another dearly. We are perfect together. Last Saturday, we got married. It was pretty awesome. Let me tell you about it. Our wedding took place in Lodi, CA, where we also live. 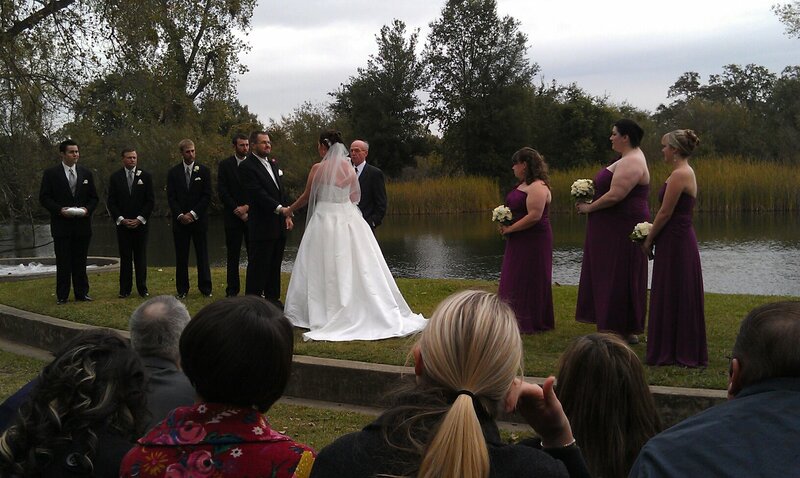 Specifically, our ceremony was held at Lodi Lake, in a little Greek-style outdoor amphitheater (though smaller and not entirely circular) that backs up to the water. At the time we chose this location, I had been reading a lot of Greek tragedy, and I liked the idea of the sparse, suggesting-antiquity setting juxtaposed against tuxes and dresses and sound equipment. The only issue—as we chose this site in the summer for a November wedding—would be the question of weather. More on this later. The reception was held in Downtown Lodi—which, if you haven’t seen it, is quite quaint and pleasant—at The Merlot Room, a banquet hall across the street from the movie theater and across (the other street) from Angelo’s, the restaurant that catered our event. The Merlot is a lovely hall—with hardwood floors and soft lighting and striking plastic chandeliers—that we very nearly missed, having decided upon a spacious room at the local festival grounds which, in hind sight, would have been more suitable for a crab feed, before stopping by The Merlot just for the heck of it—sure that it would probably be too expensive—to find that its rental price was comparable to the spacious room at the festival grounds. The wedding—ceremony and reception both—went swimmingly well. It constitutes a series of moments that I will never forget, but not without its bumps in the road. Next post: How I Nearly Ended Up Getting Married in a White Tux with Tails (that I never ordered). Yay, another blogger! I’d link to you on my blog, but as you might ascertain from my title, that just seems wrong.